Today’s Report on Jobs from the Recruitment and Employment Confederation suggests that the number of people getting jobs increased a little around the New Year. It’s too early to tell if this is a trend or a blip, but it does seem to be a real change. Each month the REC and KPMG publish the results of a survey of recruitment agencies that asks whether they are seeing more permanent and temporary appointments than in the previous month. The index measures the level of change – over 50 means more than last month, under 50 means fewer. This is welcome news and follows good Services Purchasing Managers’ Index results published last week, by Markit, the same organisation that carries out the research for the REC and KPMG. 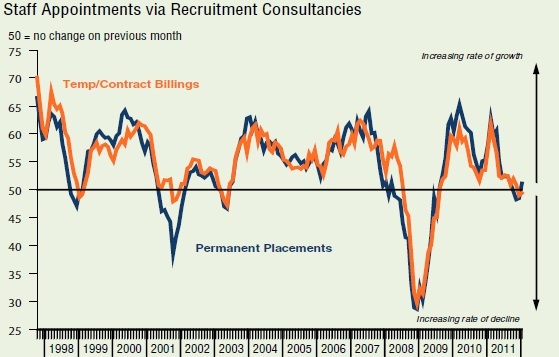 Both are in line with last month’s Reed Job Index, which found a 9 per cent increase in new jobs from January 2011. These surveys aren’t all equally reliable, but taken together they do suggest a real improvement in the last month or so. These are figures for appointments; the Report on Jobs also produces an index for employers’ demand for staff, based on vacancies. I pay more attention to the appointments figures (actually appointing someone is the best test of demand) but you need to take this index into account to get a full picture. Positive news is scarce right now and most of today’s headlines emphasise the increase in placements. Fair enough, but expect the DWP to repeat its usual line that “there are jobs out there” and that unemployment can be blamed on the attitudes of unemployed people. Today’s report actually provides further evidence that this is wrong. The working age population is on an upward trend (over the past forty years it has risen every year except 1993) and for decades governments have been trying to increase the workforce by moving people from disability and other “inactive” benefits to Jobseeker’s Allowance. This means that job growth has to be quite strong just to stop unemployment from going up – we aren’t at that level yet, let alone at the point where we can expect to see it coming down. With 94 per cent of public sector cuts still to come, the clever money is still betting that the number of unemployed people is going to rise this year. Lets see just where this goes.